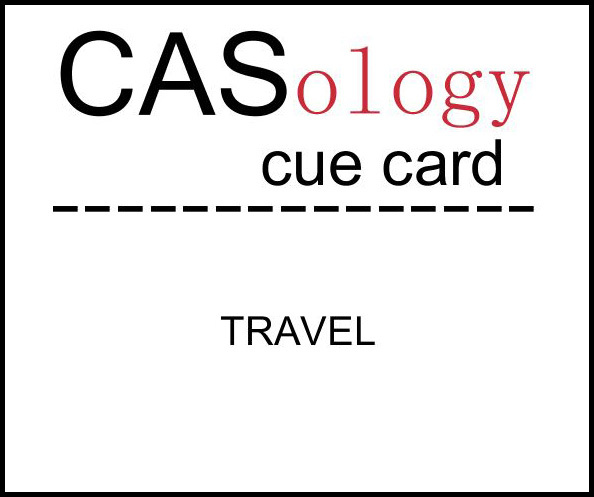 This week's CASology Cue Card is Travel! I know, I know, it's barely spring and here I am with a Christmas card! But as you know, one of my main projects for this year is to make cards for two church congregations - 300 cards all together. There's no way that I can wait until November to make them - having 300 cards to make in a short time is the fastest way to destroy Christmas spirit, for sure! So during the year,when a challenge can be used to make a church Christmas card, I jump on the opportunity. Travel seemed like the perfect cue card to adapt for Christmas - the wise guys traveled A LOT to meet baby Jesus. (Just this year I learned that they're not actually mentioned in the bible. Interesting - I'll have to look into that one!) ETA - Clarification, they are in Matthew 2, it's just their names (Caspar, Melchior and Balthazar) that are not biblical.) Guess I have some reading to do! lol! Another thing about making these 300 cards - I donate them to the churches. I'm happy to do it, but I do try to keep my costs down. One way is to limit layers. But on a very simply stamped card like this, I like to add a little something special. 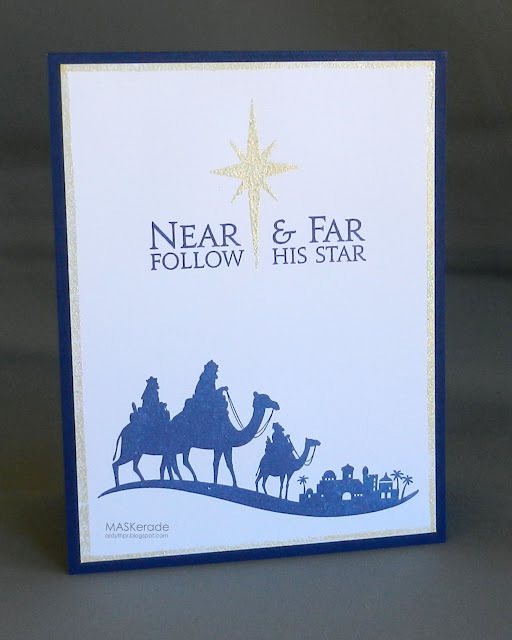 To create a frame on my white panel, I simply edged it with a Versamarker and then embossed it with the same embossing powder that I used for the star. Now it's your turn to show us how far you'll go with our travel cue card! Don't forget to link up by the deadline on Sunday at 4:00 CST. Before you mosey off, take a look at the blogs of the other DT members and see how they interpreted this week's cue card. This is beautiful ! Just perfect for travel! Boy you have lots to make! Perfect take on the cue card! Another creative card! Good luck with the 300 Christmas cards! Yikes! Beautiful Christmas card! Like you, I don't like layers for mailing! This design is awesome! That touch of embossing on the frame is just perfect with the star! Yikes! Three hundred...you really do need an early start. I love this card. The gold border finished it off beautifully. Stunning. I love this elegant Christmas card. This sounds like a wonderful project. Are the 300 cards for parishioners? Can you make some duplicates or do they all have to be originals? Your generous donations of your fabulous cards is awe-inspiring, Ardy! 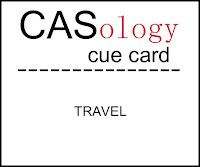 I love your card for the "travel" cue, but also especially because it is practical and you can add it to your donations! Beautiful, clever, stunning, dramatic and best of all budget friendly....especially when you are creating 300! Wow, I feel like a real sissy complaining about 110 wedding invites! Doesn't it feel great though, to do something like this for others? The feel-good feeling easily trumps the late nights and tired eyes! Beautiful ... simple and stunning ... and what a wonderful take on the cue card, the sentiment is perfect! Like Bev's my NRSV bible mentions the wise guys too (Matthew 2). This is a fabulous take on a travel theme! So smart! And such a lovely Christmas card! So wonderful for you to donate sooooo many cards! I try to buy any great product that shares the true meaning of Christmas. My favourites are hero arts: greatest blessings, heavens rejoice. This year I also got a fabulous die by Taylored expressions nativity die! Fabulous! I have a cling stamp of the nativity, I don't enjoy colouring do you want me to send it to you? Here's an interesting wise men fact they didn't make it at the first Christmas and actually visited him when he was a toddler! So cool! perfect take on the cue word, ardyth! and the perfect Christmas card... what a fantastic undertaking to make 300 Christmas cards! Wow...this is an amazing card. I love the way you think, so out of the box! You are so sweet and kind to make so many cards for your church, what a wonderful thing to do. Lovely card! I can't fathom making 300 Christmas cards. For the past 2 years I didn't even get my own cards done and what I need wouldn't equal 10% of your 300! In Matthew 2:1-12 you'll find the story of the wise men. It is a fact that they traveled to see and worship the baby Jesus, but it does not tell us how many wise men came nor does is tell us their names. Sort of unbelievable when you think about it how people change and/or add to the story. It does, of course name 3 gifts they gave so I would guess that's why we have ended up with all the stories and pictures of 3 wise men. If anyone can handle 300 cards, Ardyth, it's you! Love the glitter border you created and the gorgeous star. I adore this card, Ardyth! Your embossed edge is so perfect--did you use a ruler? Nice representation of the challenge theme. Beautiful card. :) I thought the wisemen were mentioned by name. I'll have to check into that, too. Simply stunning - and what a fantastic thing that you do! Wow! i can't believe you have Christmas stamps available! Mine are securely tucked away until next September!! Good for you! Creative take on the theme! Sorry I haven't been by sooner, Ardyth...I saw this earlier in the week and was amazed that you make 300 cards to donate! This is a classic Christmas card, and the glitter border is an awesome touch without adding bulk...LOVE that!